DOWNLOAD FROM HERE (Available only for logged users). Hi John - just another idea, would ricmi and or m8 suggestions regarding placing chart alerts on the TDI Jurik work much better on a TDI Caterpillar volatility alerts indicator. Maybe less whipsaw signals? Those indicators are available here for several months. Check this list of files. For the Caterpillar versions I stronlgly recommend to use open prices. In that way you will really help your CPU, as it will not be forced to compute every tic. That is why it crashes sometimes when there is a lot of volatility. There is even more ricmi gave the idea to make Volatility alerts not only crossing alerts. Yes I know the TDI Caterpillar volatility alerts indicator has been available for some time now. But in the same way that you have added arrows to the chart on the crossings of the red and green lines on the TDI Jurik can this be done please in the same way for the Caterpillar volatility alerts indicator? This then would reduce but not eliminate the number of whipsaw signals. Open Prices better than Close Prices ? Interesting idea. As regards the use of TDI cat, I use four cats(RSI price=0) at the same time, but, of course, on the second mt4 and 2. monitor .If you try with only one cat on the platform on which open orders, you will have a big problem with delay. I managed to solve this problem using two mt4 terminals, two monitors and WEBTrader handling orders. 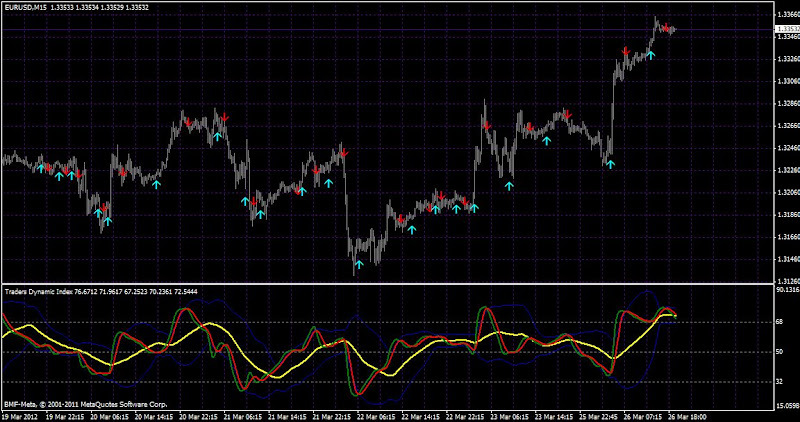 The above Traders Dynamic Index with Jurik smoothing with alerts is definitely a whole lot faster and with no delay. Like John said earlier "I doubt that any of those indicators with or without alerts will make you wealthy. There is a plethora of nice indicators with alerts, colour coded, multi time frame etc., but I have not seen yet a MACD millionaire or jurik smoothing millionaire." I mean in fact that what counts is the strategy. We would need to make an EA in order to know what is going on. Look at the advanced synergy system, this is a very good system for manual trading. By the way you are not obliged to sell and buy at the signals you can trade only into one direction (preferably the trend lol). You can use a filter, Or you will integrate it into your own individual set of indicators etc, etc. And this is giving a nice oscillator. "Like John said earlier "I doubt that any of those indicators with or without alerts will make you wealthy". It is an old fact.Indikators serve only to distinguish the position of PA, depending on the method of trading, that's all. John if you mean the Compass FX advanced synergy system (manual trading) then there are are some reviews out there. But I suppose as time and technology move on we need to concentrate on a very good system for automated trading, to eliminate the stress of "gluing" oneself to the PC for 24 hours looking for trading opportunities! Is there a best system for automated trading? Spike I have no idea about the best system. There are just systems that work right now. Londontrader, I believe that synergy is one of the best systems for manual trading, especially if you have a good trending market with low fractal dimension. However, it is up to you to pick up the right market conditions for the system.